After starting my blog last month, I didn’t really expect that people will read what I write. I didn’t even bother to actively promote my blog in social media because I didn’t want to get my hopes up. 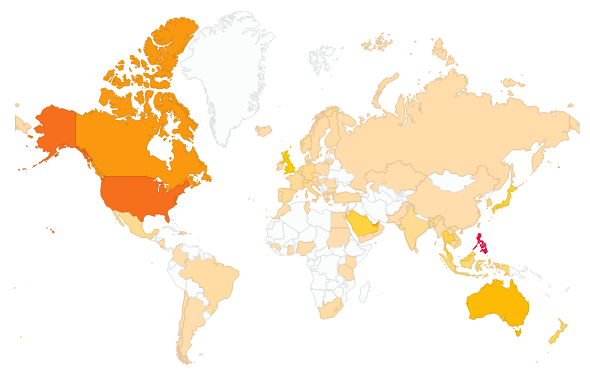 Readers from 100 countries have visited my blog. Thank you. Since I’m from the Philippines, it is not surprising that I get the most views from my country. However that was not always the case. In my first full month of blogging, the highest views came from the United States. I was wondering what I wrote that interested a lot of people from the UAE or Saudi Arabia. I then realized that there are many Filipino expats there – or maybe I’m just a hit with the Arabs. My first “hit” post (according to my own standards) was about Miss Russia. I also wrote a post about Maria Sharapova’s candy line Sugarpova, and three more that mentioned the tennis player. Sadly, I didn’t have that much views from Russia. From Russia – without love. Of course, the next step is to find a way to get readers from Greenland, because it’s just too big on that map. *To comment, just type away. NO need to write your name and email.